Do you want to finally write a novel? Do you need resources and community support to finally make progress? Do you want to finally win NaNoWriMo this November? Then, you’re in the right spot, my friend. I’m sharing my best resources, tips, and inspiration to help you succeed in planning, preparing, and writing your novel this fall. This workshop is a masterclass in helping you plan to write with Preptober and get the writing done for NaNoWriMo in November. It’s time to write your novel! A portmanteau of prepare and October, Preptober helps you plan to write your novel for NaNoWriMo in November. In the month before you begin writing, you prepare so the writing is easier during your marathon in November. During Preptober, you plot out your novel’s arc, craft compelling characters, research what you need, commit to your story, discover inspiration, plan how to manage your marathon with the rest of your life, and create a story bible. All of these things are super helpful steps to ensure a successful writing month, a fully-formed story, and a (mostly) sane writer. Each week for Preptober we have a different focus for our novel writing prep. We will come up with a story idea that will sustain a novel-length work and your sanity, craft compelling characters with character-driven plot arcs that accurately represent reality and evoke empathy from your readers, structure your story by creating a working outline that allows detail to get writing as well as flexibility for things to change, and prepare the rest of your life so you can have a happy and productive writing month. 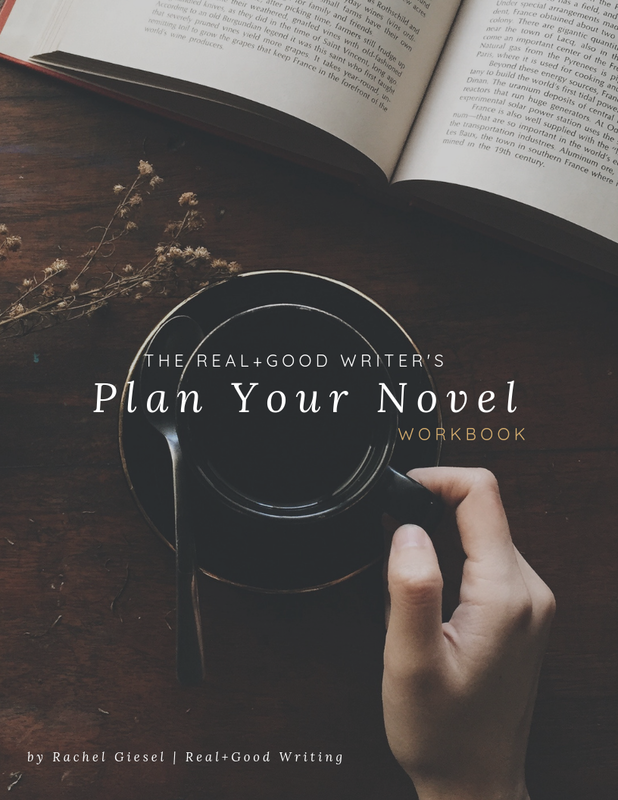 If you want to keep up with all the lessons with detailed explanations and guided worksheets, get your copy of The Real+Good Writer’s Plan Your Novel Workbook! This is a 147-page workbook that takes you through step-by-step how I commit to my novel idea, craft character-driven plots, create an outline that provides structure and flexibility, and prepare for a major writing marathon. This workbook contains all the checklists, worksheets, and inspiration you need to plan your novel during Preptober. You can download this workbook with a pay-what-you-can pricing system. Purchase starts at $12; the recommended price is $25. Hosted each November by the Office of Letters and Light, NaNoWriMo stands for National Novel Writing Month. It’s a month-long writing marathon from November 1-30 in which you write 50,000 words of your novel (1,667 words each day). It’s crazy and amazing. NaNoWriMo was designed to help get butts in chairs and words on the page. It’s not about writing the best novel ever written, but silencing your inner editor so you can get words on the page to revise later. It’s for the writers who need messy first drafts, experimental plot twists, and lots and lots of coffee. This entire workshop comes as a labor of love to support you on your novel writing journey. I understand financial constraints can make finding quality resources difficult and I genuinely want to support you and this community. Therefore, the initial version of this workshop has minimal introductory prices and a pay-what-you-can system. If you would like access to the articles and community, simply read the blog and join the Facebook group at no cost to you whatsoever. If you would like to download the workbook that accompanies these lessons, you can purchase it with the pay-what-you-want price. Because I have devoted time and energy to the creation of this material, the minimum is $12 to receive instant access to the workbook; the recommended price is $25. If you have found this workshop helpful and would like to show your appreciation, consider buying me a coffee. You can buy me however many coffees you like for $3 each on my Ko-Fi page. Here are some additional resources not created by me, but found around the web that I think are super awesome and may be helpful in your Novel Writing adventure this fall. Check out my Novel Writing Pinterest Board!